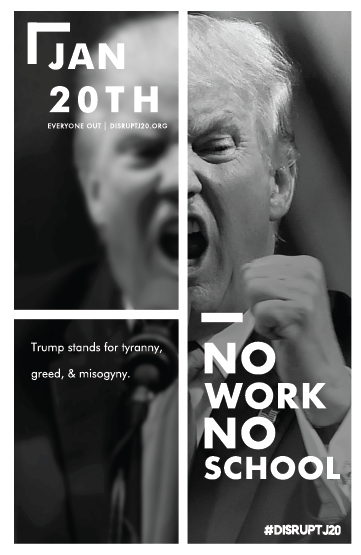 On Friday, January 20th, while hundreds of thousands descend on Washington, DC to disrupt the presidential inauguration, Asheville residents will act locally to strengthen their community while rejecting the normalization of racism, misogyny, queerphobia, corporate dominance, and intensified state repression. 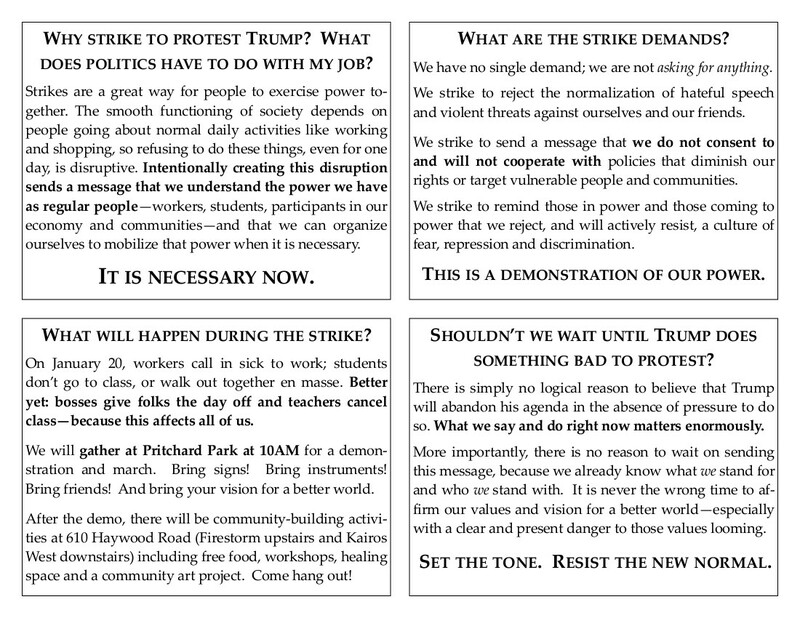 Events planned by the Asheville J20 Organizing Group include a march through downtown Asheville followed by a workshop series, community-building activities, shared food and a benefit dance party. 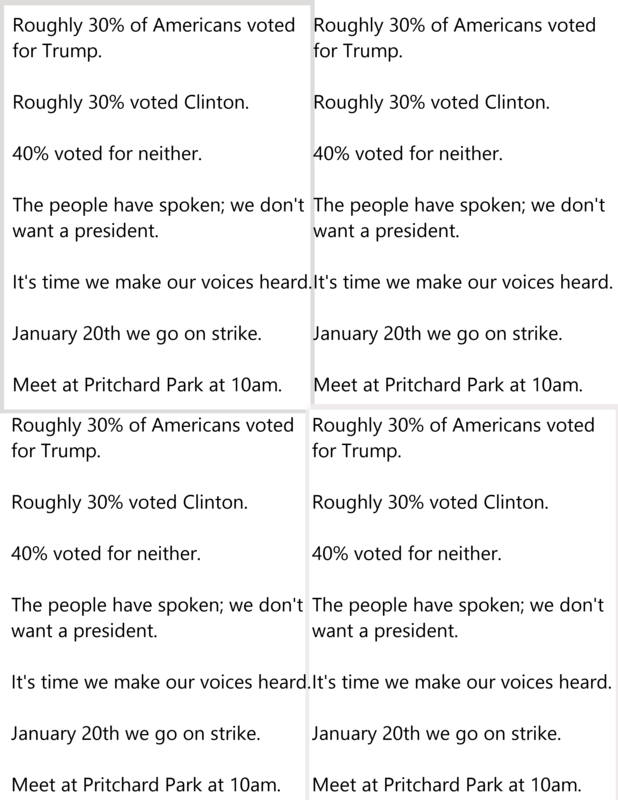 Around the United States, communities are preparing for the escalation of oppression promised by the incoming administration. According to a statement endorsed by local organizers, “This day of action is a beginning. A way for us to come together, resist together, and to start the hard work of building a new political force and program that will help us co-construct a liberated future.” Parallel events are planned for Atlanta (GA), Nashville (TN), Jackson (MS), Little Rock (AR), New York (NY) and other cities, where participants will celebrate and deepen connections between and across communities, share knowledge and resources, and offer support and solidarity to those under threat from the Trump administration. Local activities will utilize multiple venues throughout the day, including Firestorm Books & Coffee, Kairos West / 12 Baskets Cafe, The Lazy Diamond, and West Asheville Yoga. 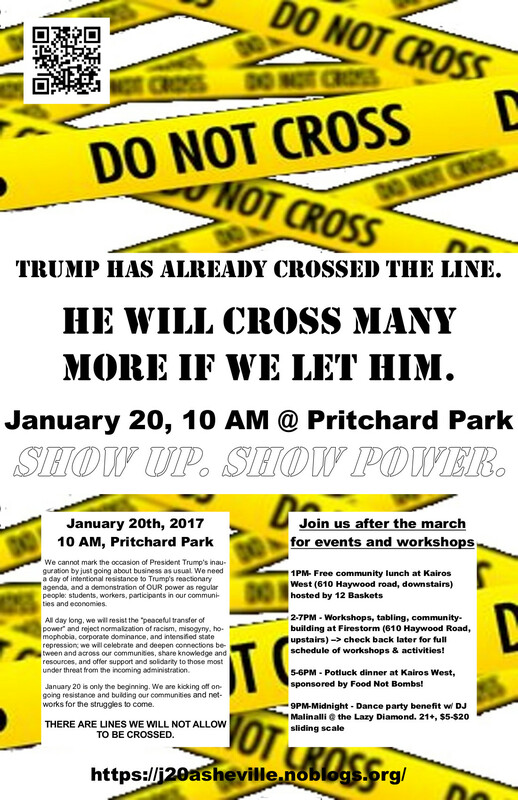 Highlights will include a 10am march starting from Pritchard Park, a 1pm community meal provided by 12 Baskets Cafe at Kairos West (610 Haywood Road, downstairs), workshops by local activists and educators at Firestorm Books & Coffee (610 Haywood Road, upstairs) from 2pm to 7pm, a potluck dinner at Kairos West at 5pm, and a benefit dance party with DJ Malinalli at The Lazy Diamond (98 N Lexington Avenue) from 9pm until midnight. 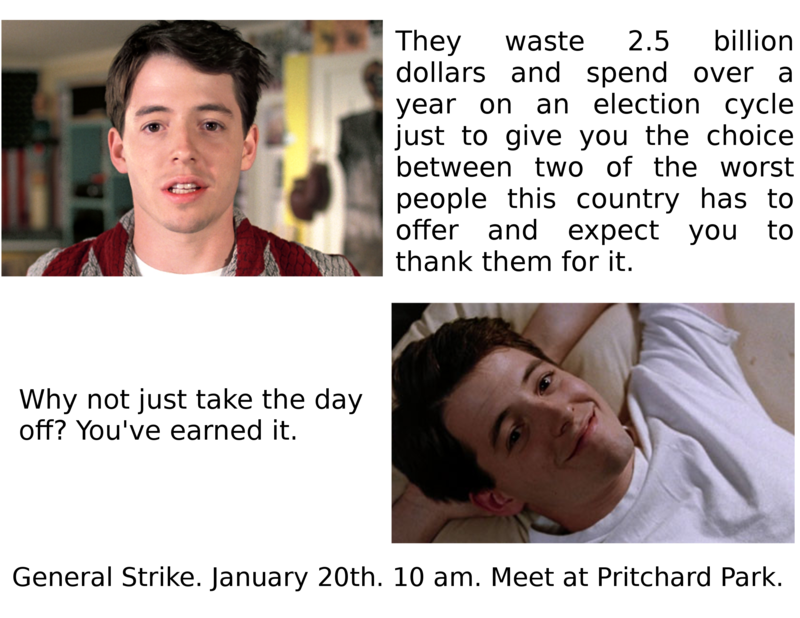 A suggested donation of $5 to $20 will be collected at the door of the dance party, but all other events will be free and childcare will be provided. 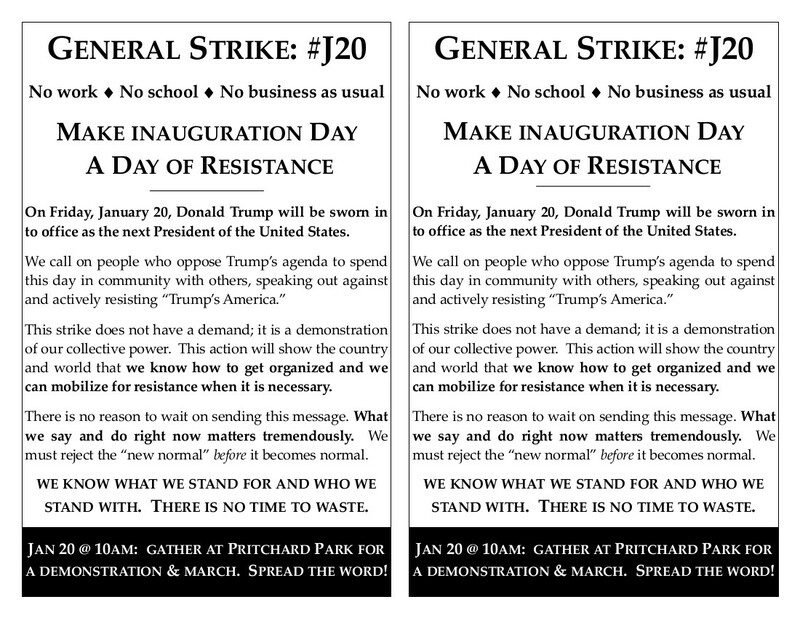 For more information on the national day of resistance see www.ungovernable2017.com and www.disruptj20.org. 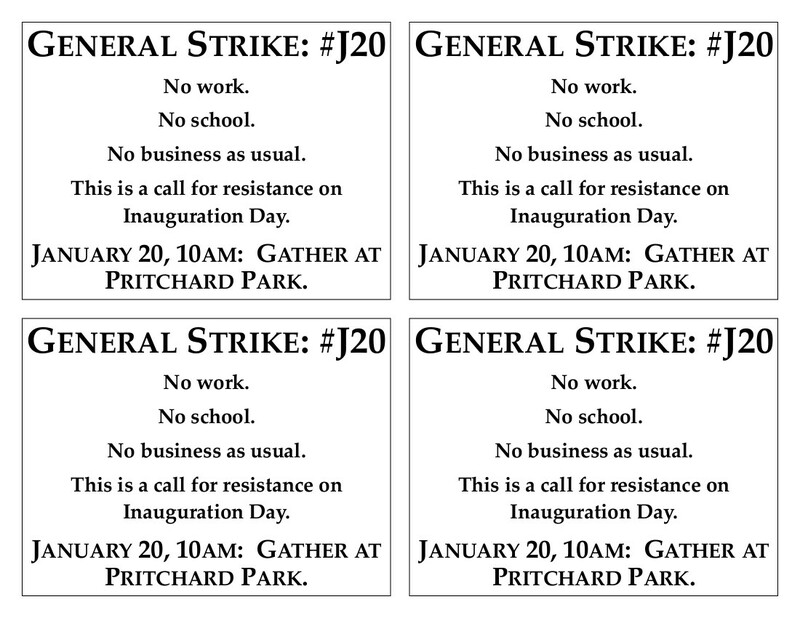 For an up-to-date schedule of local events organized by the Asheville J20 Organizing Group see https://j20asheville.noblogs.org. 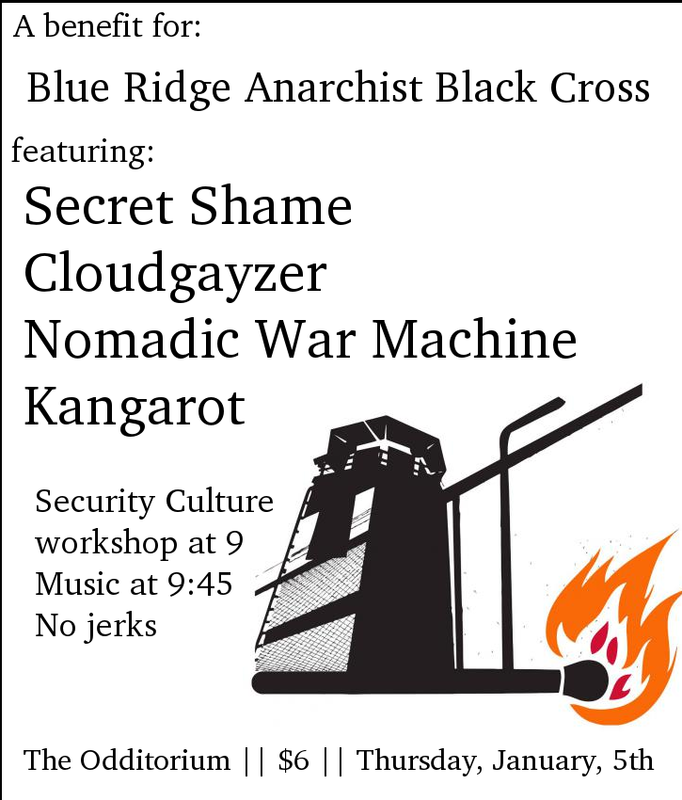 Blue Ridge Anarchist Black Cross will be throwing a benefit show on January 5th to fill their war chest before the 20th. Come early for a Security Culture workshop to talk about ways of keeping your community safe.